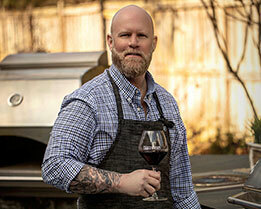 There’s definitely been a surge in online meat purveyors over the last several years. Seeing interesting and different cuts of meat on social media has helped to create a demand for high-end beef, so it’s no wonder more people are entering the highly competitive space. 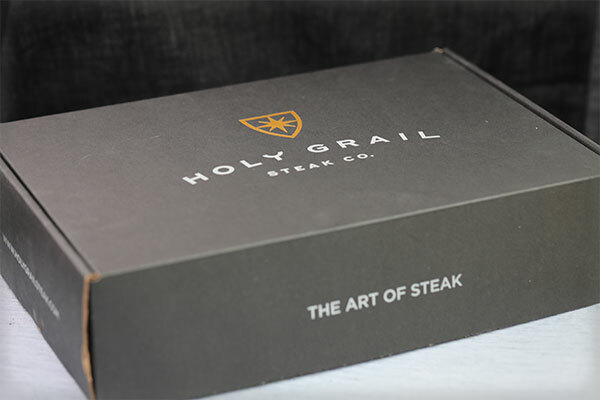 Holy Grail Steak Company, however, sets itself apart. The self-proclaimed “steak nerds, meat ninjas, and wine sourcerers (sic)…connoisseurs of all fine things ingestible” are the first (and as far as we are aware, the only) online meat purveyors to offer authentic Kobe Beef. There are, in fact, very few places in the US were true Kobe Beef is available, though many claim to offer this highly sought after beef. There are only eight restaurants in the entire US that are certified to sell authentic Kobe Beef. It’s very easy to navigate through their website, though the mobile usability has had a couple of issues when we’ve used it (timing out, etc.). Of course, that could be an issue on our end as well with connectivity and doesn’t seem to be a consistent problem. 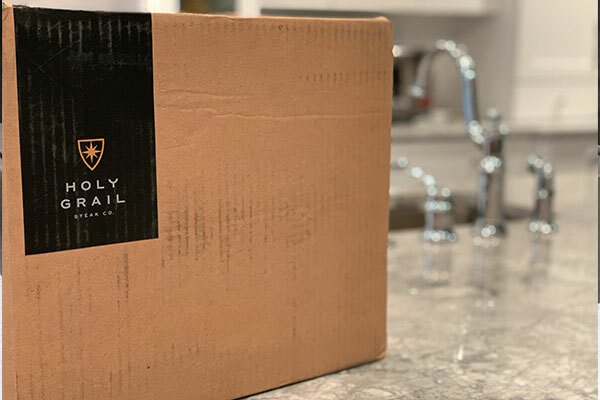 During the process, customers are able to select their delivery date, to ensure they’ll be home to receive the package and don’t risk it being stolen or damaged in high heat conditions (More on that later). During repeat orders, you’ll be sent a text with a confirmation code. Inputting that 6 digit code fills out your delivery information for you automatically. This isn’t new for online purchases and is very convenient. Beware of that feature, however. During one order, the wrong address was listed as the delivery address after we entered the code. We caught it and corrected the problem manually, but that could have been a costly mistake. 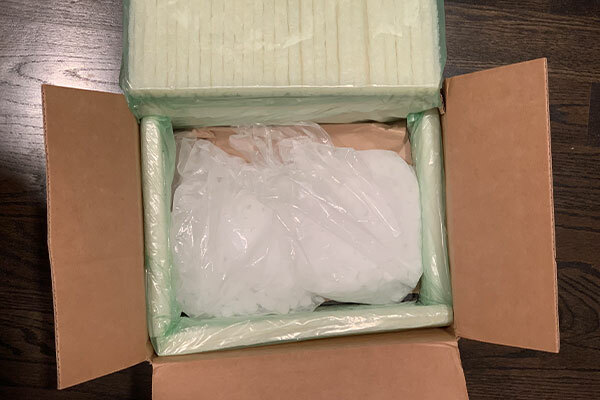 Steaks are shipped frozen with dry ice. 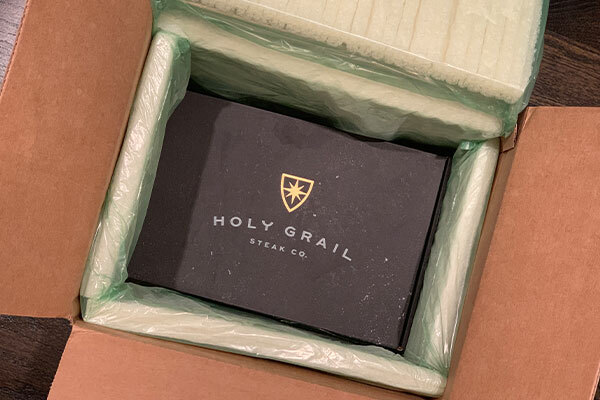 Holy Grail Steaks packages include an interior insulated casing made of corn starch, which is biodegradable. This way of shipping is something very unique and important to many people, though it doesn’t come with a premium. Also of note, for orders over 199 bucks—ground shipping is free. Holy Grail is a beef-only business, with an emphasis on steaks—specifically: ribeye, strip, and filet. They offer wagyu beef from Japan, Australia, and The United States. In addition to their wagyu offerings, they also offer upper prime grade Black Angus, both wet and dry aged. If grass fed is your jam, they offer both completely grass fed beef and “mostly” grass fed beef. They offer the Holy Grail burger as well, which is a 6 oz. wagyu patty. The meat itself has been very good; tender and juicy with the perfect mouth feel and their offerings are unique in the space. Their certified Kobe Beef, for example, is exclusively available through Holy Grail so they certainly have a corner on that specific market, albeit a very small segment of the beef industry. We found their information on cooking wagyu beef helpful as well, for those who haven’t already read our blog about cooking the perfect wagyu steak. Their environmentally conscious packaging is also an added benefit and we appreciated that aspect of their business as well. All that said, what we loved most is their ability to present various flavors of beef (called a “steak flight”) in a similar fashion to a wine tasting. It’s not a crazy comparison. Grapes, depending on the soil they’re grown in, climate, rainfall, and various other factors, have a varied taste profile which can determine the wine those grapes eventually become. Beef is very similar, in that steers raised in different regions, from different genetics, feeding practices, etc., all have different flavor profiles. This same concept holds true for various species of wood used for smoking, see our blog about that here. The shipping process could definitely be improved. At this price point it’s reasonable to assume this product has been ordered for a special occasion, so selection of delivery date is important. In our opinion, this should have been an apology met with the option to select a different delivery date or cancel the order all together. Instead, we were just assigned a new delivery date. In additional to the shipping issues, the vacuum sealing could use some improvement as well. One of the very expensive cowboy ribeye’s we received, the 36 oz. Akaushi Wagyu Cowboy wasn’t actually sealed at all, which subjects the meat to possible freezer damage. Finally, when we ordered their highly sought after and extremely rare snow beef, we received a substandard piece of beef that was simply unacceptable at it’s price point. 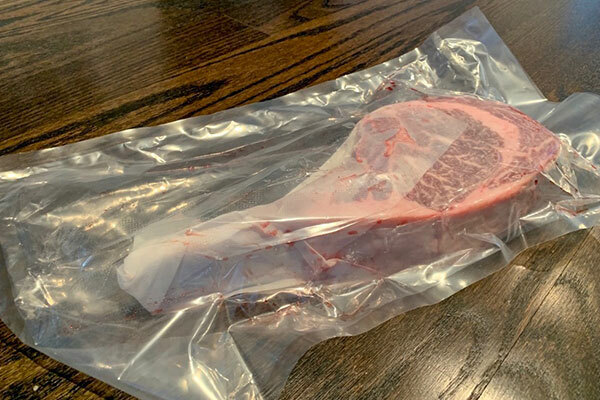 We photographed the piece of meat and contacted customer service and were met with what seemed to be a very sincere apology and a promise to send a replacement. There was a small issue with the shipping on that and as of the time of publishing we have still not received the replacement. We’ll update when that happens. First, most of the steaks from this vendor will truly benefit from a cast iron surface for cooking, so be sure you have one if you’re considering some of their wagyu beef. 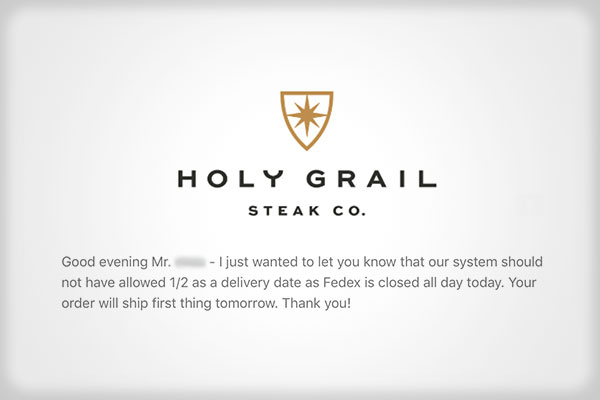 Next, because of the nature of the product line from Holy Grail, these steaks are not accessible for everyone. The price point will prevent many buyers from ever getting the chance to sample this premium beef. Finally, it’s imperative if you’re going to make an investment into this meat that you have a good instant read digital thermometer or you run the risk of ruining several hundred dollars worth of beef. This is certainly a product we could and would recommend to friends and family, with the disclaimer that it’s likely going to be a special occasion treat and it’s going to be less than budget friendly. That’s not a knock on Holy Grail’s offerings, they’re premium to be sure. It’s just a fact that from a price perspective, it’s simply out of reach for many beef enthusiasts like those of us here at grillseeker.com. What may make that a bit more palatable, however, is the occasional specials emailed out. So if you’re considering these offerings, sign up for their mailing list and watch for an occasional discount.